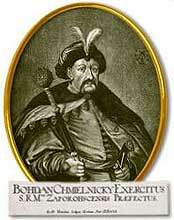 Bohdan Khmelnytsky was leader, from 1648-1657, of the Zaporozhian Cossacks who organized an uprising against Polish rule in Ukraine, which led ultimately to the transfer of the Ukrainian lands east of the Dnieper River from Polish to Russian control. His imposing statue overlooks a small park on Hrushevskoho Str. on the plot of land where the villa of Baron Hirsch once stood. One of the more influential characters in Ukrainian history, Bohdan Khmelnytsky may be viewed alternately as a hero or a villain, depending on ones’ historical perspective. Some accounts portray him as a great leader and statesman, while others view him as a figure who left only destruction in his wake. Irrespective of ones’ viewpoint, it is generally agreed “Khmelnytsky was the central figure in the uprising, who managed to keep the movement vital and under his control for a decade.” (Sysyn, 2003). Pawlyk contends that Bohdan Khmelnytskyy’s father, Mykhaylo, once had a homestead in Tovste, an interesting conjecture worthy of further investigation. 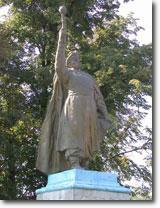 More details of Bohdan Khmelnytsky and the Cossack uprising can be found under Notable Figures.